Langtang Gosaikunda Trek is an astonishing trekking trail of Nepal specially designed with the combination of the remote and picturesque valley of Langtang. The high mountains lake such as Gosaikunda is populated by Sherpa and Tamang inhabitants which is well known for its pure culture and religion with magnificent Himalayan views. Gosain Kunda is an alpine fresh water oligotrophic lake in Nepal's Langtang National Park, located at an altitude of 4380m with a surface of 0.14 km2. Together with associated lakes, the Gosaikunda Lake complex is 10.3 km2 in size and has been designated a Ramsar site on 29 September 2007. The lake melts and sips down to form the Trishuli River and remains frozen for six months in winter October to June. There are 108 lakes in this area, small to medium in size. The challenging Lauribina La at an altitude of 4610 m is on its outskirts. So many Nepalese are visiting Gosaikunda lake to take a bath in its water in the beliefs of get rid of their sins and sorrows. This challenging trekking trail offers us an incredible and diverse journey along the Langtang valley and the holy lakes of Gosaikunda which includes long, steep and descents climate, sub-alpine dense forest, majestic Himalayan views, glaciers, most popular lakes such as Gosaikunda, Saraswatikunda and Ganeshkunda and picturesque villages. This trail would be the one of the best destination among the all those trekkers or travelers without much time but would like to explore or observe Nepal’s unique combination of culture, an amazing landscape, panoramic views of Langtang etc. it is also taken as one of the best chance to get right in among the Himalayan peaks and to get off the beaten trail, walking along the some captivating remote and relatively underpopulated areas, unique culture and lifestyle of local Tamang inhabitants. Day 2Kathmandu Sightseeing and Trip Preparation We have a day of sightseeing in Kathmandu today visiting some of the UNESCO World Heritage Sites here. We will start the day with a visit to PashupatinathTemple which is one of the most sacred Hindu sites and the location of the cremation ghats. From here we visit BoudhanathStupa which is a large Buddhist Stupa and an important pilgrimage place for Buddhists. We then visit Patan Durbar Square and the surrounding area, famous for it’s temple square, golden temple and metalwork that are crafted here. We finish the day at SwayambhunathStupa (the Monkey Temple) located on a hill overlooking the Kathmandu Valley it features a pretty Buddhist Stupa and Hindu Temple with incredible views over the city of Kathmandu. On completion of our sightseeing we will have a trip briefing to prepare for our trekking and you will have time for some last minute shopping for supplies. Overnight in Kathmandu. Meals - breakfast. Day 3Drive to Syabru Besi (1462m), 8 hrs After an early breakfast, we set out from Kathmandu for a 7-8 -hour scenic cruise down to Syabru Besi. This is a major village town and trading post for the people who stay in this region. The locals come down here to buy their essential commodities. After driving for something like 30 km, we approach pristine villages on the banks of the river Trishuli. We also get to view the enchanting panorama of the Himalaya, including the Annapurnas, Manaslu, Ganesh Himal and the well known peaks of the Langtang region. Overnight at Syabru Besi, Meals- Breakfast, Lunch & Dinner. Day 4Trek to Lama Hotel (2470m), 5 hrs We Cross through the suspension bridge while heading precipitously along a stream. The River we are following is a lot of the Langtang River. We can enjoy our walk going through oak, rhododendron and bamboo forests. There is also a variety of wildlife in these forests: yellow-throated martens, wild boars, frisky langur monkeys, red pandas and Himalayan black bears are some of them we are most likely to come across in this area. Overnight in Lama Hotel, Meals- Breakfast, Lunch & Dinner. Day 5Trek to Langtang village (3430m), 6 hrs Early morning after breakfast, we head from Lama hotel to continue our ascent above the Langtang Khola. As the trail progresses, it becomes steeper. 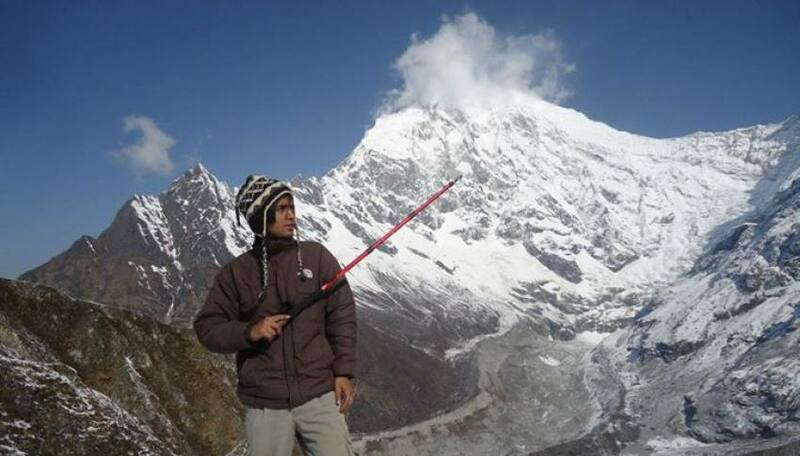 We have the most exotic sights of Langtang Lirung lying at 7,246 meter. The trail leads to a log bridge and on climbing further we come across lush meadows of Ghora Tabela at 3000m. We will see several lodges and a police check post. Further on, the route opens up into a wide valley of yak pastures and scattered Tamang villages with water-driven mills and prayer wheels. We arrive at Langtang valley after crossing a stream and reaching up a height of 3500 meters. Langtang village is the headquarters for Langtang National Park and has flat-roofed Tibetan style houses, hotels and cultivated lands yielding buckwheat, potatoes, wheat, turnips, barley etc. this is a great place to haul up for the night. Overnight at Langtang Village, Meals- Breakfast, Lunch & Dinner. Day 6Trek to Kyanjing Gompa (3870m), 3 hrs We pass through the tiny village, stone-built houses and climb to a Chorten and pass a huge mani along a gentle path of a hill. The valley relocates to a U-shaped one as we enter into a level of riverbed. Today is pretty short walking; allowing time to acclimatize and explore our surroundings. This place is famous for cheese and curd. We could sample some. Overnight at Kyangjin Gompa, Meals- Breakfast, Lunch & Dinner. Day 7Hike Cherkori (5030m), 4 hrs and explore Kyanjing village and Gompa in the afternoon We hike to the Cherkori (Tserko Ri) early in the morning. The trail passes through yak pastures before ascending to Cherkori. The sunrise view from the top of Cherkori is extraordinary. We get back to Kyangjin Gompa by late afternoon and explore the beautiful monastery and village while enjoying views of the Himalayas, glaciers, birds and yaks. Overnight at kyanjing Gompa, Meals- breakfast, lunch & Dinner. Day 8Back to Lama Hotel (2470m), 6 hrs After a healthy breakfast in the morning, we back downhill to Lama Hotel. It is about 5 hours relaxed hiking at our pace, which goes through the beautiful green forest and ethnic Tamang settlements. Overnight at Lama Hotel, Meals- Breakfast, Lunch & Dinner. Day 9Trek to Syabru Village (2260m), 6 hrs We begin our trek with a climb up to the Rimche Village. From here we descend to the banks of the Langtang Khola. We continue on an easy trail to Bamboo and begin ascending to Landslide Lodge. From here we continue our trek to Syabru Village. There are two trails as we cross another bridge. We follow the one that passes by Pahare hotel and a waterfall at 2210 m to reach Syabru Village. Overnight in Syabru Village, Meals- Breakfast, Lunch & Dinner. Day 10Trek to Chandan Bari (3330m), 5 hrs Today will be a short walk but it is important to not reach Gosaikunda today because the steady gain in altitude will help us acclimatize better to the high altitude. After trekking for a while we pass by a chorten and a checkpoint. From the checkpoint, we move south and pass by Garta Village and Phulung Monastery before reaching Chandan Bari to spend the night.Overnight in Chandan Bari, Meals- Breakfast, Lunch & Dinner. Day 11Trek to Gosai Kunda (4460m), 6 hrs Today we get to enjoy fantastic panoramic views of the Himalayas including the Annapurnas, Hiunchuli, Manaslu, Ganesh and Langtang. We follow a ridge for the most part of the day and catch a glimpse of the first of the holy lakes. The third lake, Gosaikunda (4380m), is of particular religious and cultural significance for the Nepalese and is one of Nepal’s most sought after pilgrimage sites. The lake is surrounded by mountains on almost all sides and has a great ensemble of nine other lakes to accompany it. Every year during Janai Purnima in August, hundreds of Hindu pilgrims visit the lake for a holy bath. The large rock at the center of the lake is said to be the remains of a Shiva shrine. Overnight in Gosai Kunda, Meals- Breakfast, Lunch & Dinner. Day 12Trek to Gopte (3440m) through Laurebina pass, 6 hrs We move around the lake’s shore before ascending towards the Laurebina Pass (4610m). The Helambu region begins at the Lauribina La (pass) and descends to the Melamchi valley. The trail is rough and crosses moraines, but is well marked with cairns. We pass through three more small lakes before reaching the pass. We climb a small hill and enjoy excellent views of the area. Our trail passes through Surya kunda before reaching Ghopte. Overnight in Ghopte, Meals- Breakfast, Lunch & Dinner. Day 13Trek to Kutumsang (2550m), 6 hrs From Ghopte, the trail ascent from and again trail ascent to Tharepati. The trail descends through fir and rhododendron forest observing the beautiful mountain views of Mt. Dorje Lakpa range on its way to Khutumsang. Overnight in Khutumsang, Meals- Breakfast, Lunch & Dinner. Day 14Trek to Chisapani (2130m), 6 hrs The trail descends to the delightful hill village of Gul Bhanjyang. And again trail ascent until Thodang Betini and we continue trek down to Pati Bhanjyang (1860m) and exploring a Brahman and Chhetri village. Then the trail proceeds to Chisopani. Overnight in Syabru Village, Meals- Breakfast, Lunch & Dinner. Day 15Trek to Sundarijal (1460m) and then drive back to Kathmandu, 4 hrs trek & 1 hr drive After breakfast at our own pace, we move forward through the forest of oak and rhododendron, and brings you to Borlang Bhanjyang (2440m). After we trek down to Mulkharka (1800m) from where you can see spectacular view of Kathmandu valley. Descending through the forest to Sundarijal. And we drive back to Kathmandu. Overnight in Kathmandu, Meals- Breakfast. Day 16Departure day You are free to depart at any time. Transfer to the airport will be arranged for you. Included meals – breakfast.